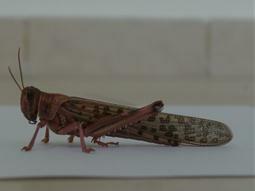 The desert locusts, whose scientific name is Schistocerca gregaria, arrived a couple of weeks ago to some countries in the Middle East. The current swarm originated in southeastern Egypt and northeastern Sudan, despite efforts by these countries to control the insects' populations. Locusts are passive fliers, and can't get far flying into the breeze; however, under the right conditions, they can fly up to 90 miles (150 kilometers) per day. Desert locusts can consume the approximate equivalent of their body mass each day (2 g) in green vegetation: leaves, flowers, bark, stems, fruit, and seeds. Nearly all crops, and noncrop plants, are at risk. What is more, locust droppings are toxic, and spoil any stored food that is left uneaten. During the twentieth century, desert locust plagues occurred in 1926-1934, 1940–1948, 1949–1963, 1967–1969, 1987–1989 and 2003-2005. The significant crop loss caused by swarming desert locusts exacerbates problems of food shortage, and is a threat to food security. Early warning and preventive control is the strategy adopted by locust-affected countries in Africa and Asia to try to stop locust plagues from developing and spreading. FAO's Desert Locust Information Service (DLIS) in Rome, Italy monitors the weather, ecological conditions and the locust situation on a daily basis. DLIS receives results of survey and control operations carried out by national teams in affected countries, and combines this information with satellite data such as MODIS, rainfall estimates and seasonal temperature and rainfall predictions to assess the current situation and forecast the timing, scale and location of breeding and migration up to six weeks in advance. The situation assessments and forecasts are published in monthly locust bulletins that date back to the 1970s. These are supplemented by warnings and alerts to affected countries and the international community. Those since the 1990s are available on the FAO Locust Watch web site [www.fao.org/ag/locusts]. FAO also provides information and training to affected countries and coordinates funding from donor agencies in case of major upsurges and plagues. The desert locust is a difficult pest to control, and control measures are further compounded by the large and often remote areas (16-30 million km²) where locusts can be found. Undeveloped basic infrastructure in some affected countries, limited resources for locust monitoring and control, and political turmoil within and between affected countries further reduce the capacity of a country to undertake the necessary monitoring and control activities. At present, the primary method of controlling desert locust infestations is with insecticides applied in small concentrated doses by vehicle-mounted and aerial sprayers at ultra-low volume (ULV) rates of application. The insecticide is acquired by the insect directly or via secondary pickup (i.e. walking over or eating the residue on a plant). Control is undertaken by government agencies in locust-affected countries or by specialised organisations.